Please note that there are four videos on this page – please scroll down. This first video outlines how you can run cluster analysis in Excel (without using the free Excel template). The next video shows a much faster way of running cluster analysis in Excel – the above approach is quite manual and time-consuming, whereas the next video provides a much more efficient clustering solution. The next video steps through how to use the free cluster analysis Excel template, as well as highlighting its various features and worksheets. 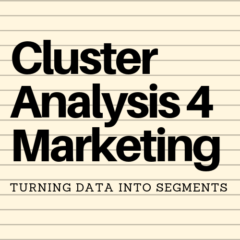 This final video is a guide on how to interpret the cluster analysis output in order to define and describe the various potential target markets.